If you’d like to teach your dog not to pull when you walk, it’s going to take a lot of practice and patience. You can make the process easier on both of you by using the right dog harness and leash. Many people just use a regular dog collar and a plain leash to try to teach their dogs. While it can be done this way, better tools can make the process simpler. 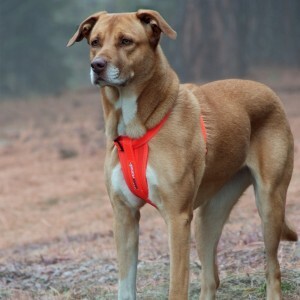 A dog harness like the dog chest plate harness from Ezydog has a chest plate that runs from the chest strap to the belly strap. Harnesses designed like this are often called no pull dog harnesses which are some of the best on the market. While the harness itself won’t instantly stop a dog from pulling, it changes the dynamic when the dog tries it. Instead of feeling the pull around the neck with a collar or in a strap across the front of the chest, the chest plate helps spread the force of the pulling out more evenly. The pressure across the chest is a steadier and less aggressive feeling, and can make the harness more comfortable. This type of harness also gives you much more control over your dog’s actions. When you’re trying to get your dog to walk with you instead of pulling ahead, a key is to not let the dog pull at all. When you have more control, you can more easily pull your dog back and keep him there. Thanks to the comfortable fit of this type of dog harness, it’s easier to do this without strain on you or your dog. When you’re faced with a dog that pulls, not only does it make walks more stressful, it can hurt your shoulder, back and arm. This is especially true when the dog is large. 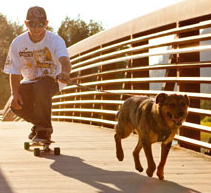 Using EzyDog’s amazing reliable shock-absorbing dog leash can help put an end to these problems. The handle is designed for a firm grip that won’t fatigue your hand. And the leash itself is made of material that gives, allowing your dog a little freedom of movement while absorbing the impact of any hard pull or jerk. You can get this type of leash in different sizes, to allow smaller dogs or large dogs that don’t pull much some more freedom, and to keep dogs you’re training or hard-pullers close by your side. These types of dog accessories can help you teach your dog to heel and walk on a loose leash. This is a great first step in keeping your dog from running and bolting away from you. Check out Ezydog for all your dog training needs.